Other elements of the tone chain do not introduce new harmonics. However they do emphasise some frequencies by transducing or amplifying them more efficiently. Guitars resonate in sympathy with the string vibrations. Any guitar will resonate more in response to some frequencies than others. Guitars do not generally introduce new frequencies although they do emphasise some frequencies more than others. Resonant vibrations have properties of attack, sustain and decay just as string vibrations do. The variation depends on the entire guitar design and construction. Some examples are well known e.g. That maple has a brighter sound than mahogany. In an acoustic guitar, the sound waves generated by string movement are too weak to be heard. The sound waves created by the guitar resonating are effectively the entirety of the sound you hear. Not surprisingly, design, material selection and construction is absolutely crucial for acoustic guitar tone. For electric guitars, the situation is very different. Magnetic pickups sense movement of the strings within their magnetic field. They don’t sense anything else. Any sound waves created by the guitar vibrating are not sensed and do not form part of the final sound. When a string vibrates, some of the energy is transferred mechanically to the guitar. The guitar then vibrates but with varying amplitude depending on frequency. You can sometimes feel solid body guitars vibrating and also feel that they vibrate a lot less than the string does. The pickup will sense movement of the guitar relative to the string but the amplitude of this movement is very small. How much energy is transferred to the guitar depends primarily on the rigidity of the strings and guitar. Guitars are very stiff compared to strings. As solid guitars are far more rigid than hollow guitars, much less energy is transferred. Some of the energy transferred to the guitar is lost via friction and some is transferred back to the strings. The energy transfers are continuous until all vibration finally stops. Because of it’s greater size and mass, the guitar loses energy more rapidly than the string. The conclusion from this is that while exactly the same rules apply to the effects of guitar design and construction for tone in acoustic and electric guitars, the results are very different. The guitar contributes almost 100% of acoustic tone but only a small proportion of electric guitar tone. It definitely does happen even if the extent is limited. If you play solid bodied guitars acoustically, they don’t all sound the same. You can hear the difference between a Strat with a maple board and one with a rosewood board, a Strat with humbuckers doesn’t sound exactly like a Les Paul. Natural sustain is entirely mechanical, coming only from the strings and the guitar before the pickup converts the mechanical energy into an electrical signal. It can be enhanced, for example by using vibrato. 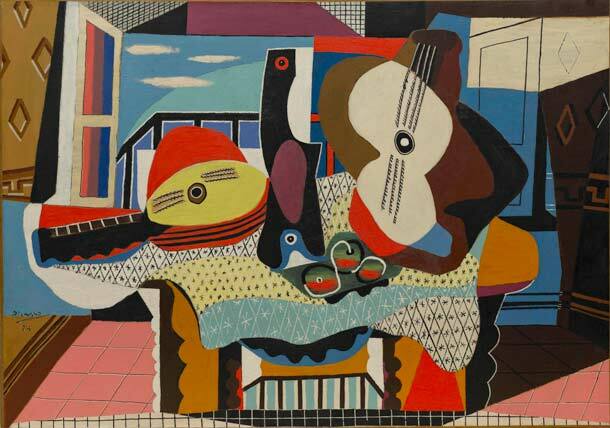 Mandolin and Acoustic Guitar by Picasso, which is which? The contribution of the guitar to sustain is negative. Guitars reduce sustain. When the guitar resonates, there is some loss of energy. Just as there is in string vibrations. If the guitar was totally rigid (big block of concrete with strings on it) energy transfer to the guitar and subsequent loss would me minimised, thus achieving maximum natural sustain. The more energy that is transferred to the guitar, the greater the energy losses and the faster the decay. This is actually fairly obvious. Acoustic guitars resonate very strongly and offer less sustain. Solid bodied electrics resonate less and offer more sustain. Better guitars do not enhance sustain, they just reduce sustain less than bad guitars. Another important conclusion is that maximising sustain (by making the guitar more rigid) reduces the extent of tonal colouring by the guitar. Additional harmonics can be introduced mechanically or electrically during the time your note is in electrical form. Many effects do this and most importantly, overdriven amplifiers do it. Amplifiers have a primary function of increasing voltage while retaining the same mixture of frequencies transmitted to them from the pickup. They have a secondary function of emphasising certain frequencies (or frequency bands) in ways that are hopefully pleasing. In other words, amplifiers also have a frequency response curve. This can be modified to some degree by adjusting the tone controls. These are usually quite limited but adequate for the job while still being understandable. The third function of most amplifiers started by accident but has become a key ingredient of electric guitar tone. When overdriven amplifiers receive signals (from previous amplification stages) whose amplitudes cannot be amplified again in the current stage without exceeding it’s maximum output level. This causes a portion of the signal to be limited (or clipped). The clipping occurs at a frequency related to each note (or harmonic). Thus an overdriven amplifier adds new harmonic content to the sound. Amplifiers also introduce compression into the sound when overdriven. This has a profound effect on sustain as once you have compression all input signals above a given volume level will be amplified to the same output volume. High levels of gain and their associated high levels of compression make it possible to produce infinite sustain at low levels of volume. Infinite sustain of clean sounds requires very high levels of volume. Speakers, like pickups, generally do not introduce new harmonic content. They can do so if they are of inadequate capacity but the results are difficult to control, often unpleasant and expensive as this can easily destroy the speaker cones. Speakers do, however, further colour the tone by having a frequency response curve which produces more volume for some frequencies more than others given the same signal strength in. Part 1 of The Tone Chain, is here. Or continue to the next article: The Tone Chain, Part 3 – Guitar Pickups. 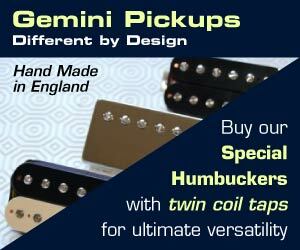 Article written by Mike Rose of Gemini Pickups. Please leave any comments and queries below!